These colored parade gloves can add a touch of color to any costume. They can be used as part of a tuxedo, for marching bands, or as part of a Valentine's Day themed costume. 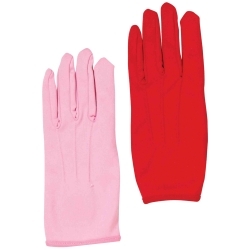 The colored parade gloves feature a snap closure and are available in pink or red. Colored parade gloves are one size fits most.